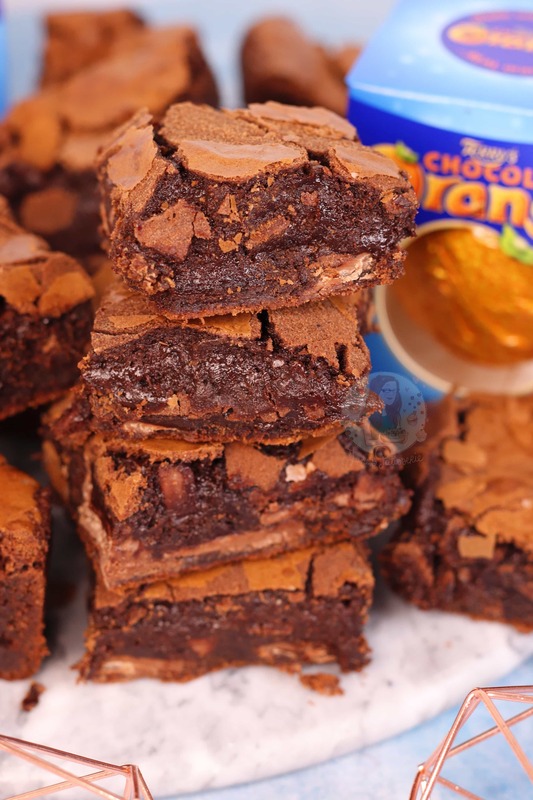 Moist, Chocolatey and Delicious Terry’s Chocolate Orange Brownies with a hint of Orange, dotted with Terry’s Chocolate Orange Chunks! It’s not secret that I adore Chocolate Orange – I already have oodles of other Chocolate orange recipes on my blog, so I think that says it all really… One of my first recipes to get seriously popular was my Chocolate Orange Cookies, which are amazing by the way, like I have no joke made them over 50 times. 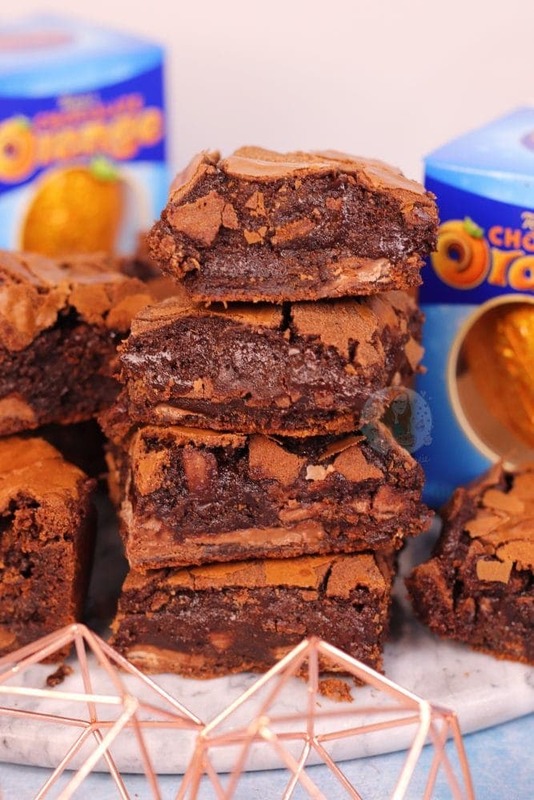 The delicious texture and moistness of a Brownie is heaven in a bite, and with the addition of the Chocolate Orange, these are utter perfection in my opinion. 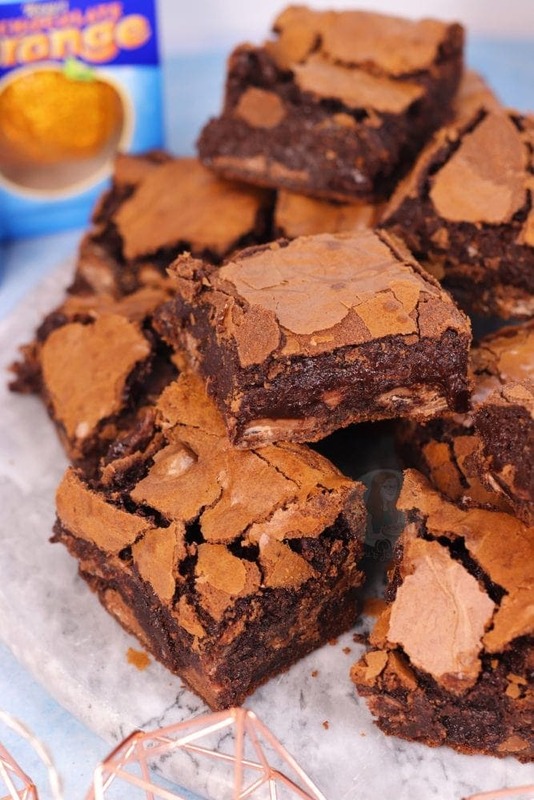 I make these in the same way as the majority of my other Brownie recipes. I melt the Chocolates & Butter and leave to cool. Whip the Sugar and Eggs till mousse like, fold through the chocolate mix, fold through the flour/cocoa powder and orange zest, and then add the oodles of Terry’s chunks. Seriously, delicious. I always find using different brownie recipes is a good thing, and I love to test other brownie recipes out – some fail completely, and some you just don’t want to mess with! I did try baking these recently by using the Terry’s chocolate Orange itself as the base chocolate (rather than Dark Chocolate) but because of the orange oil in the chocolate, it didn’t quite bake in the same way. However, if you still use dark chocolate AND the Terry’s it works wonderfully. You could tell it was different as the consistency of the Terry’s and melted butter was so very runny, whereas the Dark chocolate and Terry’s Chocolate orange mixed with the melted butter was thick and delicious. I’m not saying using Terry’s on its own wouldn’t work, but you’d need to use two-three Terry’s in that, and also two Terry’s for the chunks.. so it gets expensive. As you can see from the images, these are the gooiest and most glorious things on the planet. If you don’t like the mixture of chocolate and orange together however, then you are obviously not going to be a fan. For me, these are literally just ideal. 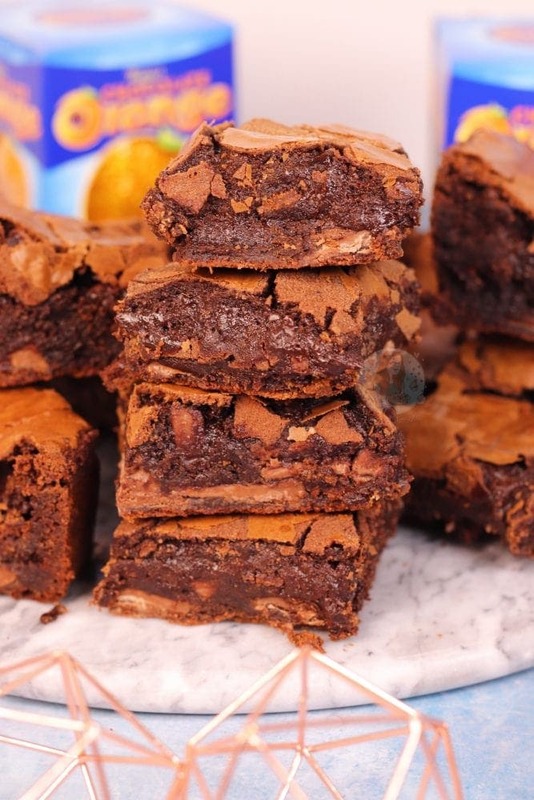 My Terry’s Chocolate Orange Cookie Bars are a much firmer type of bake (obviously, as they are like a cookie), but these you can get away with being super gooey. I do kinda like to under-bake my brownies in a way, but I realise some people aren’t the same as me in that sense. These do require quite a bit off effort with the melting, folding, folding again, and then the final fold in of all the chocolate chunks… but they are 100% worth that effort! I like to stack my brownies in pictures as you can probably tell by now if you’ve seen my other Brownies such as the Triple Chocolate Brownies, or my Slutty Brownies, but can you blame me?! How incredible do they look. 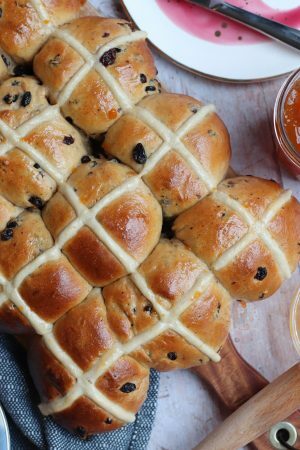 Imagine baking these bad boys, and then having one with a giant chunk of Terry’s Chocolate Orange ice cream, or even a chocolate drizzle… heaven. ENJOY! Melt together the Butter, Dark Chocolate and Terry's Chocolate Orange in a heatproof bowl over a pan of boiling water, on the microwave for 1-2 minutes until melted. Leave to the side to cool to room temperature! Once combined well, fold through the Chocolate Orange Chunks and pour into the prepared tin – bake in the oven for 30-35 minutes! Once baked, leave to cool in the tin completely. Do not replace the dark chocolate in the brownie batter with milk chocolate - it's important to use the Dark Chocolate. 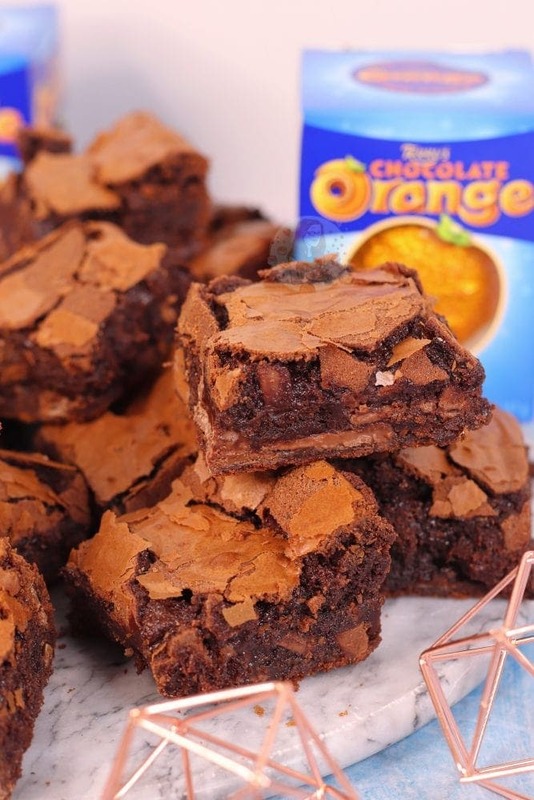 If you can’t find Terry’s Chocolate Orange anywhere for the chunks, then use 200g Dark Chocolate in total for the brownie batter. Use Milk Chocolate Chunks to fold through, with an extra orange zested. Depending on your ovens, or how you mixed the brownies up, some can take up to an hour to bake successfully. I’ve never fully understood why, but don’t give up if they’re not done after 35 minutes – cover with foil and continue to bake for longer. I poke a skewer through them and wait till its mostly clean, and the mixture doesn’t wobble in the tin. It used to be 200g Dark Chocolate for the brownie batter, and bake for 25-30 minutes - other than that, I haven't changed anything else. 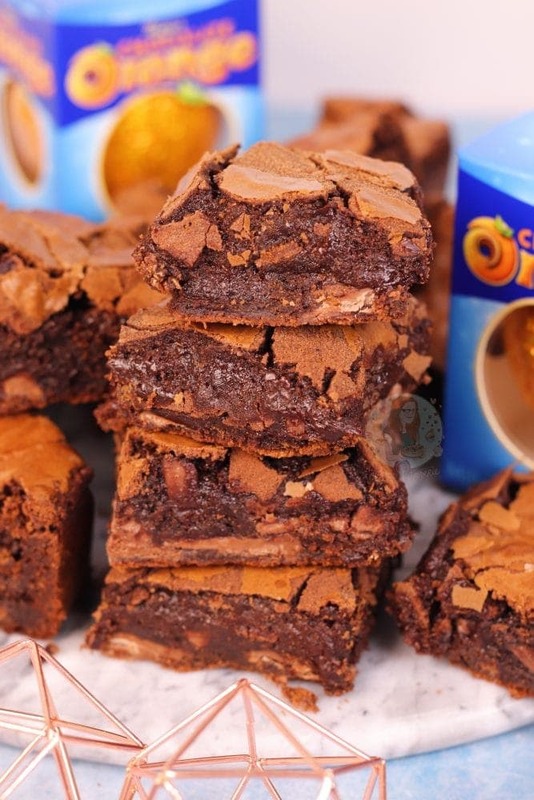 You can find my other Brownie & Chocolate Orange Recipes on my Recipes Page! Older Next post: Mint Chocolate Cupcakes! Newer Previous post: Easy Microwaveable Fudge! Hi there, I baked these brownies reducing all the ingredients to half of the suggested amount and they were divine! It’s really orangey and addictive! Your recipe doesn’t star how much butter to use? I genuinely would never ever recommend milk chocolate for a base mix of a brownie – ALWAYS dark chocolate. Much fudgier, much better at baking, and delicious. Milk chocolate doesn’t have a high enough cocoa content, and has more sugar etc, and people often think ‘Milk Chocolate’ means dairy milk/galaxy, which I really would never ever ever use for the base mix! These are cooling in my kitchen and damn they smell good!!!! I’m off to bed and hoping my fiancé doesn’t eat them in the night! I made these at the weekend for lunch with friends, they were delicious! I served them warm with vanilla ice cream. I will be trying more recipes soon, thank you Jane! Hi, is the dark chocolate too rich? I have brothers who won’t eat dark chocolate so was wondering if it was better to substitute? Hiya – No honestly it’s not, its essential to the base of the brownie to bake it correctly. Thank you! Can I please ask- do you melt any of the Terry’s chocolate orange? Or is it just folded in? Thank you! I just fold it in as the texture of it doesn’t work as well when melted. Use normal dark chocolate for the base. Well actually no you don’t, because milk chocolate doesn’t work as well. 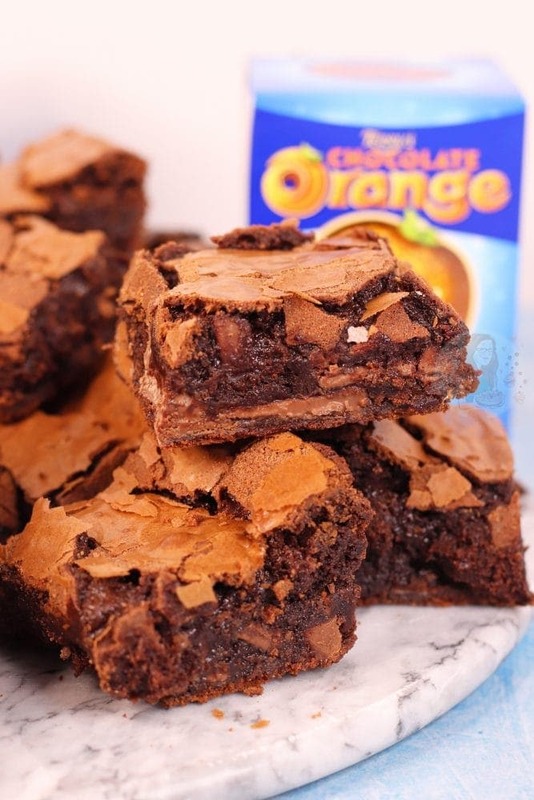 Hi Jane.. your recipe looks so yummy but We do not Terry’s chocolate orange where I am…how can I substitute that? 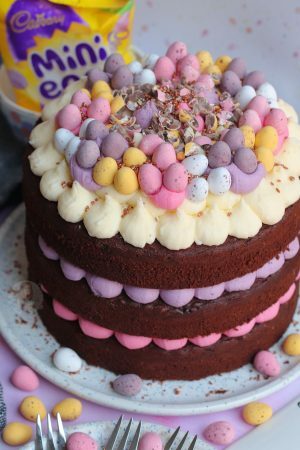 Use milk/dark chocolate and add orange extract? Or any flavoured chocolate you like. 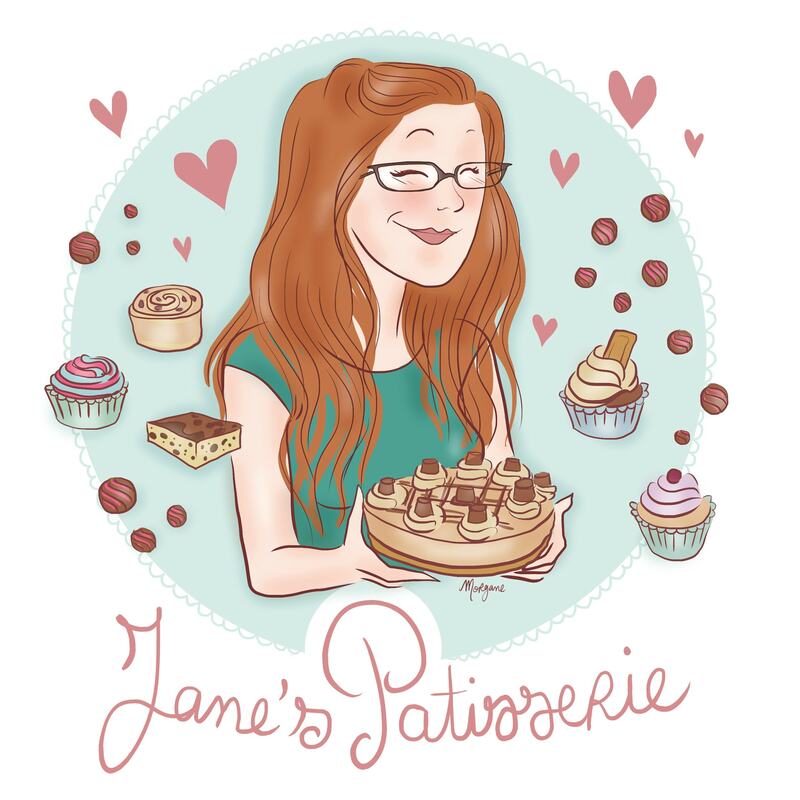 Pingback: 10 Baking Tips with Jane’s Patisserie! 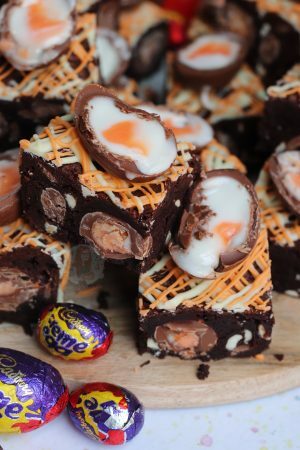 I also love trying lots of different brownie recipes and I love chocolate orange so I am definitely going to try this one as a future treat. Gorgeous recipe – I have to make these for a picnic this weekend ? Thanks Ruth! ☺️ please do! 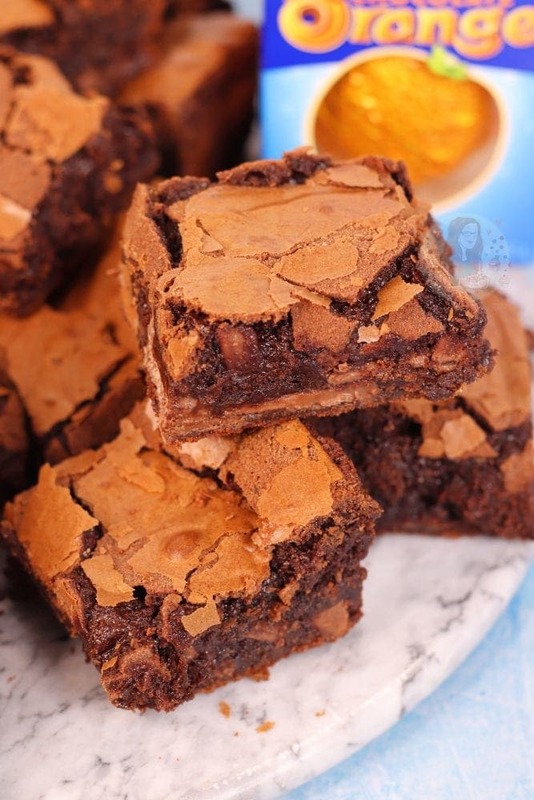 These brownies look heavenly! 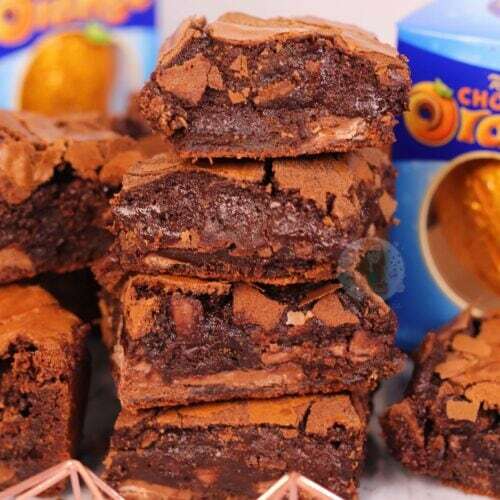 Love combining chocolate and orange. 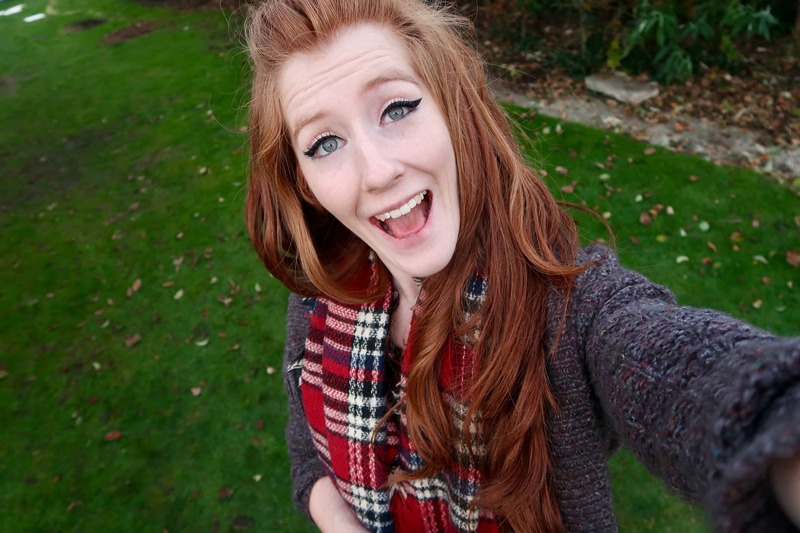 Thank you Rae! ☺️ they’re so yummy!